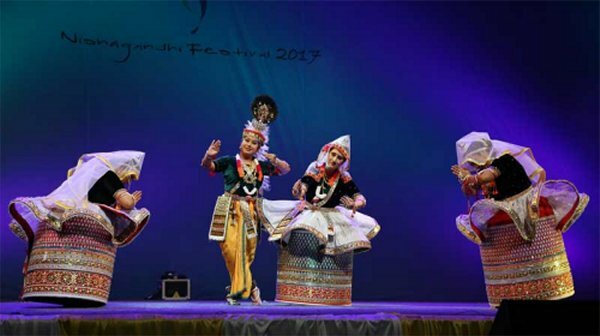 The 26th Nishagandhi Dance Festival at Thiruvananthapuram (20-27 January 2017) was flagged off by the Governor H.E Justice (Retired) P. Sathasivam, by lighting the lamps held by some ten dancers in a semi circle and more than 30 dancers providing backdrop and few standing on either side, choreographed by senior Guru Girija Chandran. The dignitaries including the Minister for Tourism, MLA, Mayor, Director of Tourism, dancer Bharati Sivaji, followed the Governor when he went on lighting the lamps. Music was played to which the dancers demonstrated the hastas. Colourful and spectacular, it was an impressive ceremony. The Nishagandhi Puraskar for 2017 was given to Mohiniattam dancer Bharati Shivaji from Delhi. From this year it was decided to have a separate exclusive dance festival and one more category of Contemporary dance was also introduced. The Governor suggested that Kerala Tourism Development Corporation could arrange a separate Music Festival.